Habinteg’s high standard of customer service was recognised in June 2017 when the Association was successfully assessed against the national Customer Service Excellence Standard (CSE) and was judged to have improved performance delivering excellent services to our customers. 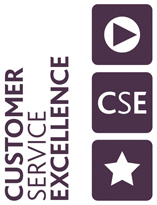 CSE focuses on organisations which seek to place customers at the heart of the service provision - looking at the development of customer insight, understanding the user’s experience and measuring service satisfaction. This was Year 2 in a rolling programme of annual assessments and, having robustly examined this year’s evidence and justification against a range of set criteria - Customer Insight, Culture, Information, Delivery, Timeliness and Quality of Service - we are delighted that the Assessor awarded Habinteg an improved set of outcomes. We have raised our areas of best practice to 16 - the highest we have achieved to date - and the 41 additional areas of service which make up the full judging criteria have all been assessed as fully compliant. For the first time in our long involvement with CSE, the Association has no areas of ‘partial’ or ‘non’ compliance. We are extremely pleased with this outcome which reflects hard work across the Association in ensuring that high standards are maintained in delivering services to our customers. Whilst it does not mean we are content to rest on the result, it is an Assessment we are rightly proud of and one which we will use as encouragement to driver further improvements.